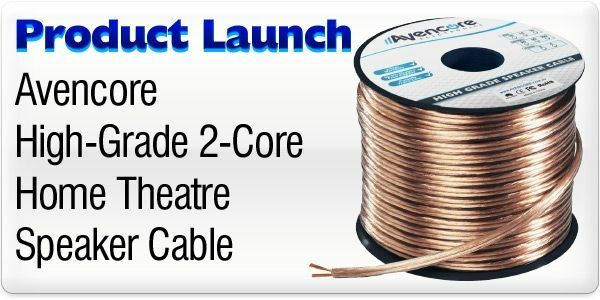 Avencore 10m Roll Super High-End 99.9% Oxygen Free 12 AWG 2-Core Speaker Cable + FREE SHIPPING! I love trivia. I tend to forget facts soon after I marvel at them, but finding new tidbits is always good fun. Like this: up to 80 percent of all the copper we've ever mined is still in use today, and will forever be recycled without any detrimental effects on its conductivity or other great properties! Just think; some of this speaker wire may have originally been shell casings from World War 2, piping from an old Queenslander house, or simply and old button collection! It won't matter what the source is, because this 10m roll of Avencore High-Grade 99.9% Oxygen Free 12 AWG Speaker Cable has been specially produced in its purest and most highly-conductive form. It's just the ticket for medium to high-end multi-channel speaker systems because it gives you the flexibility of rolling out exactly what your cable runs need at a great low price! And when you're finally done with it; recycle! I love trivia. I tend to forget facts soon after I marvel at them, but finding new tidbits is always good fun. Like this: up to 80 percent of all the copper we've ever mined is still in use today, and will forever be recycled without any detrimental effects on its conductivity or other great properties!